This indicates that although the risk from volcanic eruption at Okataina is not great, it cannot be ignored. Statistically, there is only about 1 chance in 20 that a large eruption will occur at Okataina in any 100 year period. However, when an eruption occurs it will be extremely damaging and probably affect much of the Bay of Plenty region between Tauranga, Opotiki, Murupara and Tokoroa. Volcanoes in the Okataina Centre are often not recognised as such. This photograph shows two rhyolite lava domes and a flow erupted from vents (asterisks) beyond the far shore of Lake Tikitapu (in foreground). The left-hand dome was formed during eruptions 21,000 years ago; the right-hand dome grew in the vent for the pumice deposits shown in Figure 8, which were erupted at 13,500 years ago. This eruption finished with extrusion of the thick rhyolite lava (grassed area) which extends from the vent down towards Lake Tarawera in middle distance. Mt Tarawera lies on the far shore of Lake Tarawera. Each type of magma can erupt in different ways. Explosive eruptions occur when expansion of the gas dissolved in the magma blows the magma apart as it reaches the ground surface. This fragmentation process has produced the basalt scoria and rhyolite ash and pumice which covers the entire area surrounding the Okataina Centre. These fragmented rocks are called PYROCLASTICS. If the magma can reach the surface without fragmenting, LAVA FLOWS are produced. Only rhyolite and dacite/andesite lave flows are found at Okataina, where they Okataina, where they typically pile up close to their vents to produce the steep sided cones of domes seen at Mt Edgecumbe (Figure 2), Tarawera and Haroharo. Each type of eruption occurs when magma (of any type) encounters abundant groundwater (either hot or cold) at shallow depths. The magma, at 8000 to 11000C, heats the groundwater to generate large steam explosions which can be very violent. The 1886 AD explosions at Rotomahana were of this type, and caused nearly all the casualties resulting from the Tarawera eruption. A detailed eruption history (Table 1) has been worked out for the last 21,000 years at Okataina. During this time more than 80 km3 of magma has been erupted in 11 distinct episodes, during which lavas and pyroclastic deposits have built up Haroharo, Tarawera and the other volcanoes. Each eruption episode was followed by a quiet period lasting for hundreds or thousands of years. Eruptions occurred from multiple vents during each episode, with craters up to 20 km apart in simultaneous or sequential activity. More than 40 vents have been active in the last 21,000 years, erupting mostly rhyolitic magma in pyroclastic explosions which have showered ash and pumice over large areas of the Bay of Plenty (Figure 4). The extrusion of thick rhyolite lava flows and domes has usually followed the explosive pyroclastic eruptions. Only relatively small volumes of basaltic magma have been erupted (Table 1). 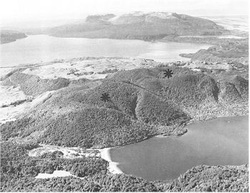 These were from Tarawera-Rotomahana area and also from a fissure that now contains the lakes Rotokawau-Rotoatua between lakes Rotoiti and Okataina (Figure 1). Eruptions which built up the present Mt Tarawera first commenced about 18,000 years ago, producing the earliest pyroclastic deposits and lava flows which can be traced to this source. Other rhyolite eruption episodes at Tarawera occurred at 15,000, 11,000 and 800 years ago, before the 1886 AD basalt scoria eruption marked a dramatic change in the style of the volcano. The 1886 eruption is the largest to have occurred in New Zealand’s recorded history. There had been no signs of impending activity, such as hot spring of steam emission, on Mt Tarawera prior to June 1886. On 1 June, peculiar waves 0.3m high on the western shore of Lake Tarawera may have resulted from early ground movements, but the first definite indications of impending eruption were earthquakes felt at Te Wairoa and Rotorua beginning at 12.30am on 10 June. These earthquakes increased in intensity until the eruption began about one hour later. By 2.30am craters along the full length of the mountain were in eruption, producing ash column more than 10 km high. Rotomahana apparently started erupting at about 3.20 am, when a severe earthquake occurred. A high eruption column which rose at 2.30am from a vent further southwest, probably from Waimangu, apparently preceded the main Rotomahana explosions. Eruptions continued from the entire 17 km long rift until about 6.00am, showering basalt scoria and mud across a large area of the Bay of Plenty with ash also falling on ships off the east coast, 220 km from the source. The 1886 AD Tarawera Basalt deposits are well exposed along the eruption rift formed across Mt Tarawera where the red and black scoria varies in thickness from 20-60m. The basalt contrasts with the older grey and white rhyolite lavas and pyroclastics which make up the great bulk of Mt Tarawera. Weak steam vents in the rift craters are now the only indication of subterranean heat on Mt Tarawera. 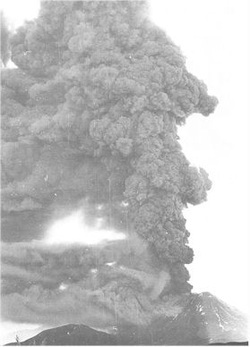 A 20 – 30 km high eruption column composed of hot gas, ash and pumice particles comprises an enormous mass of material poised high above the surrounding countryside. The column stays up only because the hot gas it contains maintains a column density lower than that of the surrounding atmosphere. If the column becomes denser than the atmosphere it is no longer buoyant, and collapses with an effect rather like turning on the tap into a kitchen sink, magnified 100,000 times. The column can fall out of the sky at great speed, and on reaching the ground, this downward velocity is transformed into horizontal speed over the ground surface, forming a PYROCLASTIC FLOW or SURGE. A radially expanding flood of hot ash and pumice fragments in a turbulent gas cloud flows outwards over the ground surface at speeds which can exceed 200 kilometres an hour. Pyroclastic flows and surges can also form in other ways, but the effects are the same – the total and almost instantaneous devastation of the entire area covered by the flow. Unlike lava flows, it is not possible to outrun a pyroclastic flow, and their high velocities and hot temperatures make them especially dangerous. Nairn, I.A. 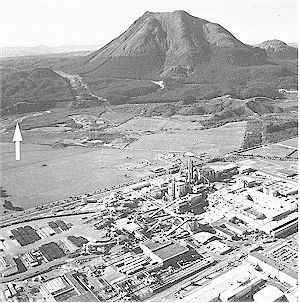 1989: Sheet V16AC-Mount Tarawera. Geological Map of New Zealand 1:50,000 Map (1 sheet) and notes.Wellington, New Zealand. Department of Scientific and Industrial Research.